Konami was the first game developer to unleash their E3 line-up and the theme seems to be what's old is new again. Taking a cue from Sony's HD remakes of God of War and Ico/Shadow of the Colossus, Konami announced they are revisiting many of their top franchises with HD remastered collections. Headlining the HD remastering was the announcement of the Metal Gear Solid HD Collection which will be released in November and will include enhanced versions of Metal Gear Solid 2: Sons of Liberty, Metal Gear Solid 3: Snake Eater, and Metal Gear Solid: Peace Walker﻿. Jumping from the PSP to consoles, Peace Walker will soon be available to a whole new audience. The games will come on one blu-ray disc for PS3 and two DVDs for Xbox 360, and will include new trophies and achievements, marking a first for the Metal Gear series. Legendary series creator Hideo Kojima will be personally overseeing the development of this collection. In addition, Konami announced a newly remastered Zone of the Enders Collection﻿ which includes Zone of the Enders and Zone of the Enders 2 and features HD graphics, new art, remastered audio and trophies/achievements.﻿ The Silent Hill Collection﻿ was also announced and will give fans polished up versions of Silent Hill 2 and Silent Hill 3.﻿﻿﻿ Both of these HD collections will be available for PS3 and Xbox 360. Konami said that the Metal Gear Solid and Zone of the Enders HD collections have a feature called "Transfarring" which allows players to transfer their save game data for games available on both handheld and console, such as Peace Walker. In even more Metal Gear Solid news, Konami shed more light on Metal Gear Solid: Snake Eater 3D﻿ for the Nintendo 3DS. The game is a reworked, updated version of the popular PS2 title now presented in full stereoscopic 3D. Explore jungles where the foliage and action literally popping out as you guide Snake's infiltration into a Russian complex to rescue a scientist being held captive against his will. An all-new feature called the "camouflage photography system﻿" has been added, enabling players to outfit Snake in camouflage based on photographs taken in-game of your environment. The game is expected to come out this winter. New versions of Silent Hill were also unveiled, with Silent Hill: Downpour for PS3 and Xbox 360, and Silent Hill: Book of Memories for Sony's upcoming PS Vita handheld﻿﻿. Another game mentioned during the Konami briefing, but with few details provided, is Frogger 3D. Celebrating the 30th anniversary of Frogger, this new Nintendo 3DS title marks the return of the classic street-crossing action the series is known for, but now in full stereoscopic 3D. Konami also teased the next entry in the Contra franchise with a swirling fireball trailer that culminates in the forming of the classic Contra "C" logo. It's rumoured that this next title will be a reboot for the franchise, similar to what happened with Castlevania: Lords of Shadow that came out last year. Of course, a new addition to Konami's Pro Evolution Soccer was also shown, with improved AI and the ability to switch ball control more seamlessly. The improved AI allows for more intelligent runs towards the ball, while other AI teammates will make themselves available, instigate runs, and visibly call for the ball. One of the more exciting announcements was a new trailer for the horror themed PS3 and Xbox 360 game NeverDead. The third-person action title is set in a fantasy and horror-influenced world of the near-future where supernatural creatures reign supreme. Using a combination of butterfly design-inspired swords and an arsenal of guns, players will do battle with ruthless creatures that have the ability to collect and repair any lost limbs by reattaching them. 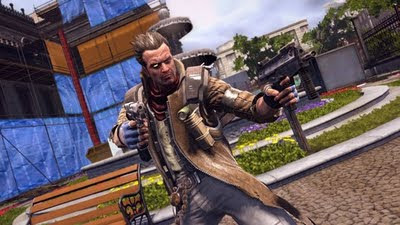 NeverDead is expected to release by the end of 2011. Certainly lots to look forward on the Konami front, I can't wait to get my hands on these titles, many of which will be in our hands later this year.